Lombok is not just another island with a tropical nature. It’s a magical place, a piece of land that is home to numerous breath-taking beaches, majestic temples, one-of-a-kind villages, and, of course, thrilling mountains and waterfalls. Today we’ll talk about Senaru, the so-called “gateway” to the world-famous Mount Rinjani. Some call it a village, even though that’s not 100% accurate because this area combines more than one settlement. The biggest trekking center on the island – that’s probably the best description for this spot. People from all over the globe visit this place to admire the scenery, talk to the locals, and dive into those tropical island vibes. 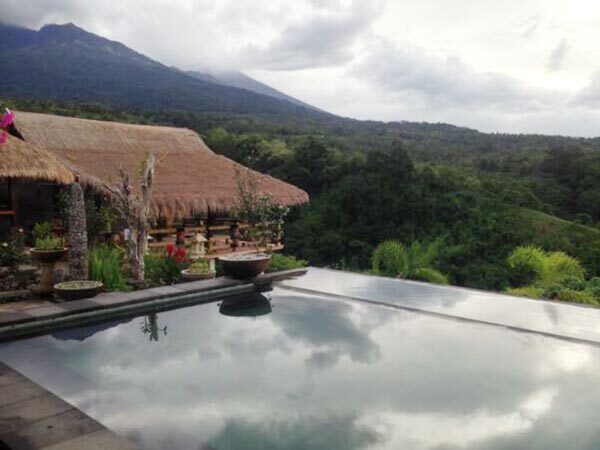 Senaru is located on Rinjani’s ridges and offers some of the best views you’ve ever seen. Obviously, with this tourist landmark being so popular, the locals simply had to make some money on it. With that said, you won’t have any problems with accommodations here. The steep valley feels like it’s right there in front of you, and I can promise you that once you look out the window early in the morning, your life won’t ever be the same! Yes, compared to some of the least favored villages and tiny communities, the prices on the hotel rooms around here are higher. But still, for a foreign tourist, everything is more than fair, especially for a place like this one. When you arrive in Senaru, you’ll be amazed by the number of tourists sneaking in and out. It truly is a Heavenly place, perfect for taking million-dollar selfies. Plus, the peak of Rinjani gives the visitors the chills (in a good way). Even if climbing up that scary mountain is not really a part of your trip, just standing in front of it and “paying your respects” will be among the best experiences in your life. Can you see the valley between our current destination and the Teres Genit village? It’s jaw-droppingly gorgeous; plus, you’ll find a series of enchanting waterfalls in that area. And while some of them are relatively easy to reach, the rest of the waterfalls will require some sleight of hands. The locals will be more than happy to help you find the locations. If you’re not on the clock and have a couple of hours to spare, make sure to pay a visit. Trust me: these landmarks are more than worth it. Now, I have to mention that even though Senaru is a super-fine place and doesn’t require any “support” to be popular, it’s safe to say that mount Rinjani is the main attraction in this area. AKA Gunung Rinjani, it’s the pride and joy of Lombok. Tourists visit the island to climb this mountain and take pictures on top of it – that’s just how it is. Keep in mind, though, that climbing a mountain this big is no joke and it will take you at least three days to complete the climb. If you’re not sure about this part of the trip, I’d recommend talking to the local guides. They’ve been helping foreigners conquer Rinjani for decades and know exactly what they’re doing. Again, this is a serious adventure, one that will require all of your attention. So, if you’re not sure about it, let the mountain be. But if you are all in, let the professionals guide you. Now, I just mentioned that this is a very rich, lush, “green” area, and that means that the birds and animals in Senaru are also worth our attention. They are usually active early in the morning and later at night; so, try to wake up early to see what the wildlife around here is all about. The birds, monkeys, and butterflies are all nice and cute. Kera, the macaques with super-long tails, aren’t really afraid of people anymore and like to chill right on the road. The black monkeys, in turn, are a lot less sociable and prefer to stay away from the humans. You’ll be able to see them near the waterfalls. I have to also mention that there’s a village where the trail of the mountain begins. The Sasak people that live in that village are known as the cultural protectors of Rinjani. The forest around it is also considered to be sacred for its religious and spiritual values. It would be best to ask the local guides to show you around because, on your own, you might miss a lot. The gardens in Senaru are always full of spices and fruits, and if you ask nicely, the men and women will be happy to feed you. Furthermore, a guide will give you access to their houses and a chance to experience the simple yet adorable village life from within. It all depends on your mood, of course, and you’re not obligated to go through this. Are you on this trip with your significant other? Then look for the special spot where you can watch the sunset. This is one of the best romantic spots on the entire island, that’s for sure. Even if you’re all alone, this view will linger on long after the journey to Senaru is over. The Sasak people are very friendly and religious. And they tend to share their music, dancing, cultural heritage, and life lessons with the foreigners. Sitting underneath the majestic mountain and watching the locals sing, dance, and have fun, is an amazing experience! There’s a hydroelectric power station in the area; for some reason, it’s favored by the tourists; you can also pay it a visit. The hot springs all over Senaru are even more popular. But, again, without a guide, you’ll never be able to find them, especially if you don’t know the Sasak language. However, in all fairness, the waterfalls are the champions around here, and they are unbelievably beautiful. Interesting fact: the Senaru-Bayan area is where the Wektu Telu religion (or, rather, belief system) came to life. While at the destination, you’ll have to rely solely on your two feet. That’s right: there are no transports in this part of the island, but they’re not even necessary. Take some time to appreciate what nature has to offer. On this website, we talk about every single landmark in Senaru in more details – go ahead and check out the respective reviews. You already know that along with mount Rinjani, the picturesque waterfalls are also great tourist magnets. The regular fee for a guide is +/- 50K IDR, which equals 3, 65 dollars, give or take. Tiu Kelep and Sendang Gila will take your breath away, that’s for sure. They will make you forget about all the troubles in your life and give you an overwhelming feeling of being connected with nature. I know that sounds like a quote from a bad advertisement page, but that’s true. I was there myself and can confirm that these waterfalls have a healing effect and you’ll always want to go back to them. If you’re in Mataram, getting to this place won’t be a problem. As I said earlier, this is a very popular tourist spot, and the road is nice and comfy. If you’re a fan of public transportation, try hopping on a bus that leaves for Anyar. However, please keep in mind that these buses don’t have a strict schedule and you might have to wait for a long time before you catch one. Besides, the path from the big city to Anyar will take no less than 3 hours, which is a drag, especially when the bus is full of people and there is no air to breathe. From there, you’ll have to get in a bemo and only then get to Senaru. My advice to you: don’t EVER go with public transportation unless you want to ruin all the fun this trip could possibly give you. A rental is the best option. And while a bike is more thrilling and exciting, I’d go with a car, because the road can be a bit bumpy and you don’t want to hurt yourself before even checking out the mountain and the waterfalls. The ride from the airport to the city is very straightforward: just pay the taxi driver and get ready for some hiking in the back seat. But don’t let him fool you: 70-80K IDR is more than enough for a ride that long. I personally know some couples that wanted to take the bus from the Lombok Airport and stick with public transportation all the way to Senaru. They saw it all through, but had to spend almost two days on the ride! This is the best place to be if the Lombok landmarks are the main reasons for your trip. And yes, climbing Mount Rinjani is an epic experience! Awesome review, keep it up. The waterfalls are magical, and the water there is always nice and warm. Senaru is where you get that tropical island experience, you got that right. I've never seen waterfalls these beautiful, and I've seen many. The guides will take you there in less than 30 minutes and you'll have more than enough time to enjoy them. I did it - I climbed Rinjani with my friends! It might not be the tallest mount in the world, but sure felt like it when we were on top. The guides were great folks, and they knew English. Don't take the bus, because it will ruin your trip. Go with renting or hiring if you want to take the most out of this adventure.